This dual layer back case cover is designed to offer complete protection to your device. The outer layer of the case is made from Polycarbonate and the inner layer is made from TPU material. It has raised bezel which offers added protection to the screen of the device. The case can also be used as a stand for seamless hands-free viewing. This golden colored case for iPhone 6Plus has a round arc design which offers not only 360 degree protection but also an amazing feel in hand. The product has been manufactured using the advanced CNC technology of Germany which ensures an ultrathin structure that fits tightly on the device. It comes with a perfect metallic luster and can provide maximum protection to your device not only from scratches and dust but also from the impact of fall. The cover has perfect cut outs. This premium quality transparent TPU cover for iPhone 6plus and 6s plus has a gold tinge to it which gives it a perfect look. It enjoys electroplated edges which not only provides a classy look but also offers a smooth feel in the hand. The raised lips of the cover ensure best protection of the lens of the camera of the device. The cover lets you access all the buttons and ports of your device easily. This beautiful protector comes with electroplating mirror effect which makes it stand apart in the crowd. The real tempered glass protector with 9H strong hardness is scratch proof and can ensure the best protection for the screen of your device. The oleo phobic coating on the case makes it proof from fingerprints. The cover has 0.3mm thickness and weighs minimum. It adds a luxurious look to your phone while providing it the best protection. This transparent TPU cover will not hide the beauty of your gadget but will provide protection to it. It is made from highly flexible, imported quality TPU material and the superior electroplating workmanship ensures a shiny and luxurious look. The precise cutouts gives easy and thorough access to all the buttons and ports and the ultra-thin design provides a bulk free feel in your hands. This premium quality wallet case cover in gold has a rich look and the flip cover ensures the best safety for your device. This cover comes in form-fitted design for iPhone 6 plus and 6S plus. The glitter cover provides complete coverage to your device from dust and fingerprints. It can also absorb impact and the inner, soft layer ensures that there is no scratch on your expensive mobile. Along with the phone it can also hold cards and in addition to that this cover can also work as a stand. This high quality back case cover has a hollow mesh design to ensure good heat dissipation from your device. Fine workmanship coupled with the best quality material has given this cover a high class look. It provides coverage to your device from regular wear and tear as well as scratches and damages. The cover is form fitted for iPhone 6 plus and 6s plus and hence you can access all the ports and buttons on your device easily even when the cover is on. This case comes in two pieces. A hard polycarbonate made rose gold colored bumper and a clear TPU made back cover which is flexible and soft. The raised lip ensures better protection for the screen of the device, while the camera cutouts provides coverage to the lens of the camera. The cover has inner dot pattern which prevents bubbled smudges on the phone back. The frame is reinforced at the cutouts to ensure better durability. This case cover gives a defined look to your device due to its exact fit. Being lightweight and thin it does not add to the bulk. This hard case cover is made from high quality poly carbonate which makes it proof from scratches. The exact cutouts offer easy access to the ports and buttons. It protects your gadget from the impact of drop, regular wear as well as dust and scratches. This rose gold case can actually add to the look of your device. This cover is designed to provide comprehensive protection to your device by using the latest shock absorption technology. It includes protective corners to ensure complete coverage for your device. The raised edges on the front as well as back side ensure better protection for the camera and the screen. The case is made from premium quality polycarbonate and TPU which makes it resistant from scratches and provides continued protection to your device. The cover has a précised fit and the new active touch technology makes it more responsive in hands. This luxurious gold plated cover protects the back and the frame of your device from scratches, finger prints, dusts, abrasions as well as drops. This aluminum metal case comes with aluminum bumper along with mirror back case. The two parts of the case are detachable ensuring better shock absorption in case of accidental drop. It has a customized cut out design for easy access to the buttons and ports. 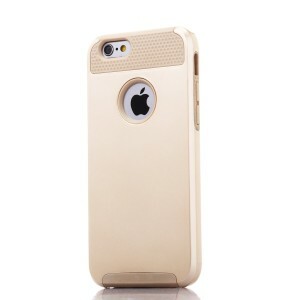 This designer back case in gold has a lattice design along with golden lining. It is made from high quality poly carbonate which ensures not only superior protection for your device but also a satin smooth finish that is sure to feel great in hands. The precise cut outs provide easy access to all the buttons and ports without removing the cover. It provides nice protection to your device while accentuating its’ looks. This slim hybrid armor case provides great protection to your device along with a nice look. It is made from dual layer which ensures better shock absorption. The hard cover is made from tough plastic and silicone which makes it proof from scratches and regular wear. This beautiful and luxurious iPhone 6 Plus and 6S Plus cover has a perfect metallic finish, is light in weight and comfortable to hold. The case cover protects your phone without adding to the bulk ensuring a better grip. The cover comes with detachable aluminum bumper and acrylic mirror finish back which gives dual protection to the device from shock and damages while adding to its overall look. The 3D rhombus diamond pattern makes this cover ideal for your stylish iPhone. This transparent back case cover with free flowing gold glitters can actually add a new charm to the overall look of your phone. The cover has prefect precision openings for the camera and button hole. It gives full protection to your device from scratches and damages. This case for iPhone 6 plus and 6s plus not only looks rich with the right touch of golden but also offers superior protection to your device. It comes with a protective hard outer shield and a scratch proof soft interior. The case provides a perfect fit and can offer protection from dust, impacts as well as scratches and fingerprints. 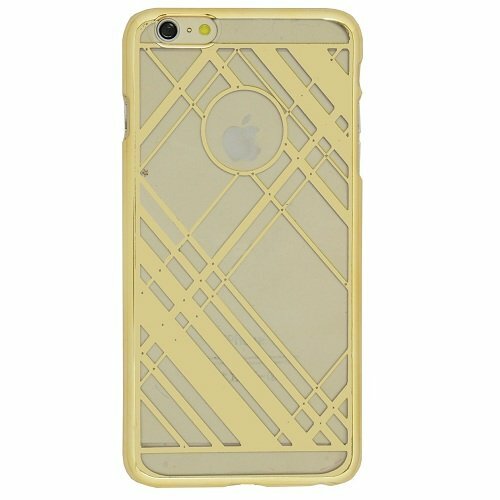 This gold case is also available in other colors than black. This bumper case cover is designed to offer complete protection to your device. It comes with aluminum made detachable bumper along with an acrylic glass finish back. The cover is lightweight, comfortable and protects your device without adding bulk to it. It has a snap on fit on iPhone 6 plus and 6s plus and offers great protection not only from regular wear but also from accidental drops. The mirror finish coupled with the gold shade gives this cover a truly luxurious look. This high quality iPhone cover has a rubberized exterior which ensures a better grip minimizing the chance of fall at the first place. 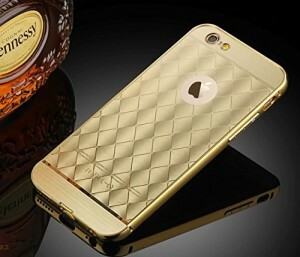 The metallic color of the case gives it a luxurious look. To ensure the best protection of your device the cover includes 2 parts, one outer poly carbonate made layer and an inner TPU shell which provides protection from shock as well as scratches. Give your phone a new definition and protection with this cover. This Ultra-thin bumper cover is made from high grade aluminum which adds to the look and makes the cover actually effective to protect your device. It comes with dual tone color with gold highlights on the edges which make it look stylish and luxurious. The cover is easy to install and remove and convenient to use. The cover can give maximum protection to your device from dust and drops.